This chapter analyses the interrelations between struggles over mining and scalar configurations of political power. It draws on an anti-mining protest in the department of Tolima, Colombia, where the South African company AngloGold Ashanti is currently preparing to open an industrial gold mine. 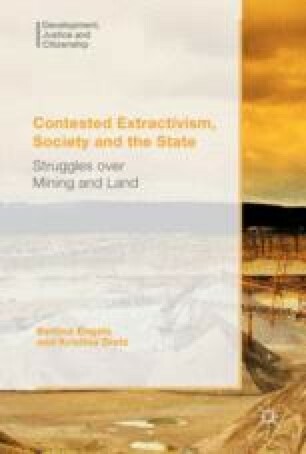 The chapter aims to show that struggles over mining are located within the interactions between state structures and the agency of local actors. It is shown that scalar configurations of power, for example political institutions, de- and recentralisation policies and legal frameworks, constrain and enable social engagement in struggles over mining. At the same time, through the exertion of participatory citizenship, actors opposing an industrial mining project contest the scaled geography of state power. Theoretically, the chapter combines insights from debates on the politics of scale, and from critical development and democracy studies. AngloGold Ashanti (2014). La Colosa, una oportunidad de oro para el Tolima. http://www.anglogoldashanticolombia.com/presentaciones/la-colosa-una-oportunidad-de-oro-para-el-tolima/. Accessed 23 Sep 2015. AngloGold Ashanti (2015). La Colosa, una oportunidad de oro para el Tolima. http://www.anglogoldashanti.com.co/saladeprensa/Presentaciones/presentacion_lacolosa_2015.pdf. Accessed 29 Nov 2015. Duarte, C. (2012a). Gobernabilidad minera: cronolgías legislativas del subsuelo en Colombia, Centro de Pensamiento Raizal. https://gobernabilidadminera.files.wordpress.com/2012/01/gobernabilidad-minera-cronologicc81as-legislativas-del-subsuelo-en-colombia.pdf. Accessed 26 Apr 2016. Duarte, C. (2012b). Descentralización y Recentralización en Colombia: Fases y disyunciones en la implementación de un modelo noclásico de gobierno. https://descentralizacioncolombia.wordpress.com/. Accessed 8 Mar 2016.